The number one cause of financial loss in retail businesses can be reduced significantly by managing the problems of fraud and theft head-on. Suspicious transactions often are not innocent human error, but a systematic skimming of your inventory, cash and profits. Retailers and banks no longer have to search separately in transaction systems and video to find evidence of fraud. XProtect Transact from Milestone takes full advantage of the surveillance functionality of XProtect Basis+, XProtect Professional, and XProtect Enterprise: the best IP video management software available today. Together, you get a total solution to manage your digital video monitoring for protection against theft, integrated with transactions for clear evidence of fraud. The video surveillance handles shoplifting, vandalism, and robberies while XProtect Transact combines it with transaction data to investigate fraud. XProtect Transact speeds investigations to determine fraud by integrating video surveillance images with Point Of Sale or Automatic Teller Machine transaction data: 1-to-1 correspondence of images to transactions. 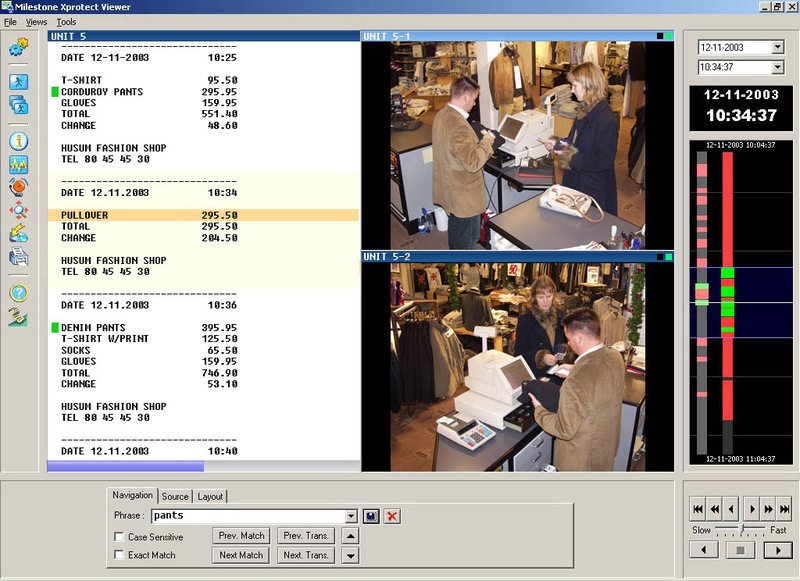 Simultaneous displays of receipt details with high quality video recordings of the events in action visually verify what really happened. Whether the problem is internal or external perpetrators, you can quickly search and view the data from your transaction system linked with video evidence to determine the cause of exceptions. Stored in a local or central database, it is easy to find suspicious transactions with just a click of the mouse. XProtect Transact offers several user interfaces: access the system from a central office, branch location, from home or when travelling! XProtect Transact is an affordable add-on product for use in conjunction with XProtect Basis+, Xprotect Professional or Xprotect Enterprise. [Find out more...] Milestone Xprotect Transact "Factsheet" , 1,006kB pdf file.